Our experience of life will tell us that encouragement is truly the oxygen of the soul! I decided to put together some of the quotes I’ve come across over the years that I found most encouraging. Which one of these encouraging quotes resonated with you? Do you have one that you particularly like that is not listed here? Do share. This post is written for the letter E Blogging From A to Z April Challenge 2014. José and I are also doing the Challenge on our blog From 7Eight. Hard to pick just one! But this is the one that stood out to me the most. It’s pretty all-purpose. Bookmarked this one, will get back to it every now and then. Have not quite recovered from somethings, and perhaps all of them put together will do some good. I love this quote and think of it in difficult times- “Remember…Even this will Pass!” Thanks for sharing these. .. I like Denis W. Don’t want to take the risk of doing nothing. My favourite quote from the above list is the one by Iyanla Vanzant. I honestly believe that all our pain and all our pleasures come into our lives for a reason. And we must greet them both, since they help us grow. This is a lovely list, Corinne. book marked this post.. will come back to it again …. Love postive quote or words of encouragement. When I real like to hit them when around some cranky person. Loved the quotes, loved the message. Very thought provoking. I especially liked the first one — we are imperfect and flawed, but beautiful. This is the message we need to send our children. What a wonderful way to praise them. Love all the encouraging quotes, Corinne. You know how much I love quotes and daily affirmations. I’m convinced they help get our minds on the right path. I love the one by Sylvia Plath about self doubt. So true! Thank you to you for always being so encouraging and helpful to other writers. I see your kindness and warmth scattered all over the place and it makes me feel so good. A super collection of quotes, Corinne. I loved ‘Everything we experience—no matter how unpleasant—comes into our lives to teach us something.’ So true! Thank you again for sharing. Lovely!! Great topic choice! Encouragement is always welcome! Thanks, Darla. It sure is. 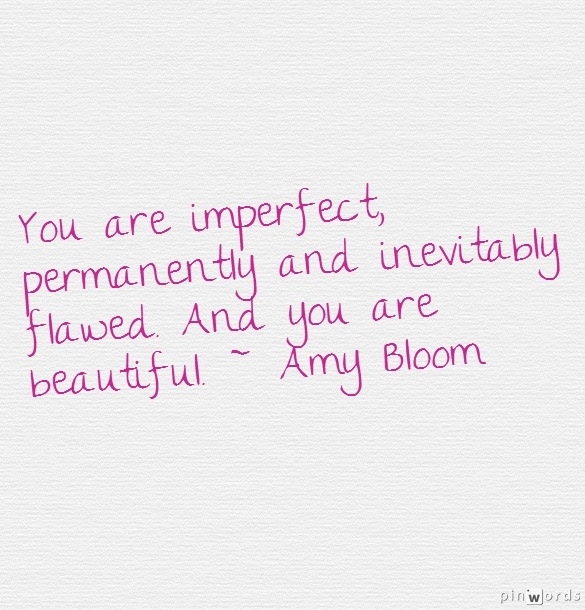 I absolutely loved this quote ‘You are imperfect, permanently and inevitably flawed. And you are beautiful. ~ Amy Bloom’. Such a thoughtful post this is Corinne. Glad you liked it, Kripali. Thanks. I love the quote from C. S. Lewis – writing allows us to create anything we wish. How freeing is that? Yes, the more we start seeing ourselves as creators, the better it is for the world too, don’t you think, Martha? There is a reason all of the words above are VERY quotable! You know, Kim, I love that one and follow it too! I considered sharing it here, but thought I’d use it in another context. Glad you liked them, Debbie! It’s the Bruce Lee quote that resonates with me today. I fear that so many times we are encouraged to go and copy someone else. They are successful; they have the formula so follow them. And we have so many successful imitators that that too starts looking attractive, like it’s a shortcut to sucecss. Except, our lives and our circumstances and the way we experience life is different. So true, Damaria. We do the world a disservice when we try to be anything other than ourselves! Great quotes and ones I will be able to use daily so I am printing them out to hang on my wall. Thanks for taking the time to share them with us. Thank you, Jayanta. I’m you found them motivating. What a gorgeous selection of posts! Thank you, Sophie. Stephen King is an amazing writer! Thank you, Lisa. Good luck with the Challenge. Love the quote by Oprah. Transformation happens when you dare to be awakened to greater heights. When you stay open no matter what. Letting each experience, especially the tough ones, strengthen you and add depth and wisdom. I also love quotes. Yes, Suzy. I’ve learned this from experience too. I can see why the ones on taking risks appealed t you, PB. You’ve been doing that a lot in recent years. Keeping my eyes fixed for your ‘I’ post! Wow! What a great bouquet of inspiring quotes! Glad you liked them, Shilpa. And yes, that one is my favourite too! Thankyou for such encouraging quotes! They are brilliant!! I peruse goodreads sometimes, and I have a collection of wallpapers that have inspirational quotes too 🙂 There are people who believe just reading a quote will not change anything, but I feel otherwise. It’ll give you that moment’s inspiration to break free of whatever is holding you back. Goodreads is my absolute go-to place for quotes, Leo! I love that many of them are ‘new’ (to me, at least). I know people think quotes don’t do anything, but for me they’re an affirmation of the power of words! Glad you liked them. Yes, Sylvia Plath’s words are always amazing! Thank you. Wow! I need these quotes. Loved them all. Thanks. The 1000 fragments of a broken dream are enough to give us 1000 new dreams…. A wonderful collection of Quotes, and this is a post we can always come back to, to get inspired again and again…. The Dalai Lama quotes are too good, and the one for writers is what we all need at the moment ! Thanks, Sreeja. I loved that dream one too – it’s so true! Thanks, Pro. Actually I came across it only recently and like you said found it simple and powerful like you said. The quote-junkie in me is dancing happily! 😀 Love the first photo! 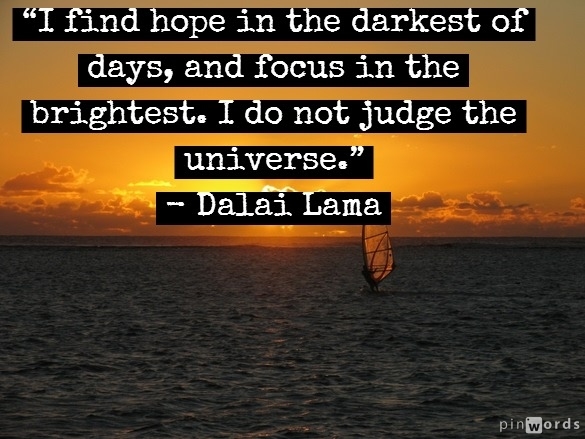 And the Dalai Lama quotes are all inspiring! 🙂 Thank you for brightening my day! I knew you’d like this, and the topic too! Thanks, Vidya. I particularly liked Bruce Lee’s “Always be yourself, express yourself, have faith in yourself, do not go out and look for a successful personality and duplicate it.” A powerful message in simple language. Thank you so much. And the same to you. What a great and uplifting collection, Corinne – thank you for this! Thanks for sharing that quote. I hadn’t read it before! It’s lovely.